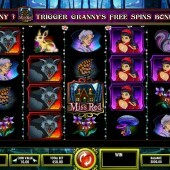 Fairytale-themed slots are 10-a-penny in online casinos these days, but one developer who are trying something new are IGT, whose Miss Red slot has cranked up the features to offer players some original touches. The game has bets ranging from $1.00 to $50, with a maximum bet of $2,250 available. Miss Red works off IGT's Multiway Xtra system, so you'll be playing 1,024 ways every spin. That means you can win on paylines running right-to-left as well as left-to-right, on top of paylines on the central three reels. This is a feature that has stood well for IGT slots and personally I was really pleased to see it being included on this slot. In terms of symbols, everything in this fairytale adventure has been given a good graphic novel-style makeover. In fact, some of the images wouldn't look out of place in a tattoo parlour: we get poisonous flowers, toadstools, fierce-looking wolves, the woodsman, woodland creatures, the grandmother, and the raven-haired Miss Red who looks like she's about to bust out of her bodice. One neat little feature in the base game is the End2End Expanding Symbol. If you hit a payline with two wolf symbols at either end of a payline, the symbols inbetween will transform into wolves. If a Miss Red icon appears, she will turn into a Wolf-Miss Red icon instead. Similarly, a row bookended by two Miss Red icons will turn into a row of Miss Red icons. Wolf icons turn into Wolf-Miss Red icons. And it's these double icons that act Wild in the game, substituting for just the Wolf and Miss Red symbols. Earn up to 280 Free Spins! 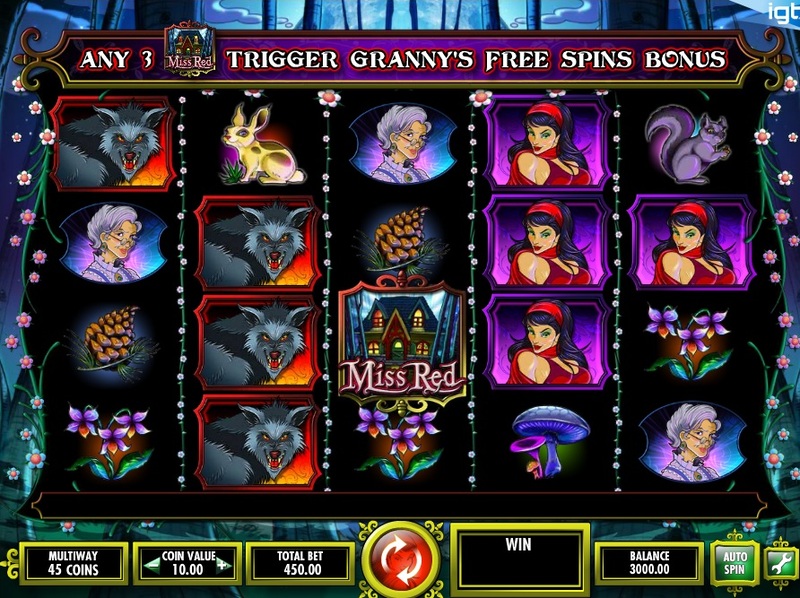 Three Miss Red House icons on reels 2, 3 and 4 triggers the Granny's Free Spins Bonus. First you need to select from five baskets of flowers to determine your spins total - anything from 5 to 15 spins. Free spins can be retriggered by hitting three more Scatters on the right reels. You can earn up to 280 spins this way. This is certainly one of those games where a big outlay to begin with can pay dividends. The End2End feature was pretty lucrative for me and I regularly managed some pretty nice regular wins, certainly 4 or 5 times my stake on some occasions. What's nice is the little animated sequence that plays when you achieve an End2End payout. So, ditch your Microgaming's Mad Hatters, dump your Little Pigs Strike Back by Leander Games and give this (big, bad) boy a go. Just remember to bring your biggest bankrolls.